Various hotel wellness centres and a range of wellness concepts, but each offering total relaxation and a magnificent view of Lake Bled. Take a look at the packages with included wellness services! Treat yourself to Rikli-style holistic relaxation at the Rikli Balance Hotel, which houses the Živa Wellness Centre – one of Slovenia’s best. 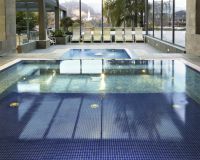 Here you will find thermal water pools and an extensive range of wellness programmes with an Alpine twist. In 1818 two thermal springs were discovered on the shore of Lake Bled. In 1850 the Grand Hotel Toplice was built, which is home to the Luisa Spa. The Thai relaxation and wellness centre at the Hotel Park in Bled will spice up your Alpine-style unwinding with a hint of the Orient.